Thought I would share with you some inspiration that I have been looking for myself on the net! I know for many it is your favorite time of year as well. I have lots of ideas swirling in this pea head of mine, but here are some more I found today. I love the plaid box! 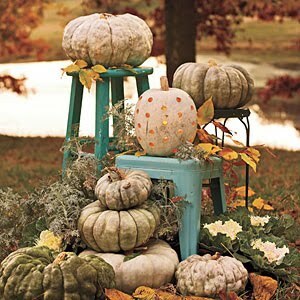 This next idea with white pumpkins, is super cute. Last year I tried my hand at painting some pumpkins.. I will try try again this year...I think I can do it! I never know til it strikes! Have a wonderful day, wonderful weekend, and I will see you tomorrow night for the newbie party. I can't wait to start decorating for fall, although I am forcing myself to wait until September 1. At 12:01 am. I loved those pumpkins you painted last year. I had never thought of painting them until I had seen yours. OK, now I have two identical comments? Blogger is killing me. I love fall colors. that first one you picked is really nice. love it! Even though I don't want fall yet, I am getting excited about decorating. I love all the fall colors! Oh, I love that rooster lamp you have, I'll have to keep my eye out for one...he's perfect! 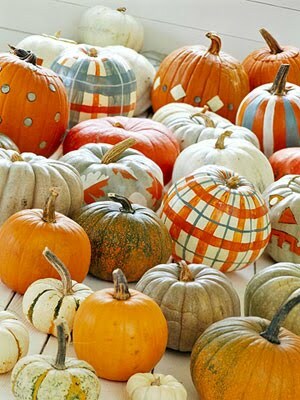 I'll have to try painting the pumpkins this year I love those plaid ones! I'm going to keep things simple this year, just some pumpkins and mums near the door, we will see if that happens! All I see here is RED. 104 yesterday. I can't even think orange. But I can dream... thanks for the inspiration! Tag! Your it! LOL! I pinned several of your pics here this morning for my fall board. I love the plaid box and plaid pumkins too. Lots of great inspiration for sure. Thanks! I love fall and all the colors. Maybe I can decorate some ~ since I missed back to school decorations. Debbie, I can't even think about fall decor right now. Just too hot! I'll have to take joy in yours for the moment. Love it all, Debbie, and autumn is my favorite season of all, so I'm always anticipating it. I've started a few projects with very light touches of it here and there. Love the painted plaid ones and the candle. I'm not too fond of white pumpkins though. Saw them around plenty last year but I think the French chic barely there color thing just doesn't do it for me with a pumpkin. I did try Martha Stewart's glittered ones and they were dreamy. Has to be done with fine glitter though. I love the front porch, and your tablescape from last year. Fall is usually not my favorite season (I'm a spring color kind of girl), but your examples are inspiring me to try something new and creative this year. Have a happy weekend, Debbie! I love Fall. It's my favorite season. You've given me an idea with the stools and the pumkins. I have several stools I can use. I love your rooster lamp. I have roosters all over my house. I especially like your rooster sign above the lamp! I am smitten with white pumpkins and paired with the blue they really pop! Can't wait to see what you do. And btw the little real white pumpkins I bought for last year are still in good shape. Lovely ideas..Debbie! I really liked your fall decor, especially the lamp shade and the candles. This is making me super excited for Fall and I just know you will have some lovely decorating ideas and pictures to inspire me more! Hope you are having a Super Saturday, Debbie! love the fall inspiration,, neversaw a plaid pumpkin,, thats a first form! Your photos are great and what a cozy home you have,, you got a lot going on in that pretty head! Mmmmmmm,...we're almost into fall - isn't that lovely. I love your inspirational ideas. I have been making myself wait to decorate, but have started hunting and gathering. It is hard to really get in the mood though when it is over 100 degrees! Looking froward to Fall decorating too!! I love the autumn, it is my favorite time of year next to Christmas!! You do have a niche for decorating, and fantastic ideas! Your house is always so beautiful..
That makes me wish for Fall, my favorite time of the year. I love al the cute ohotos you showed. Now that the grandkids are back in school this babysitting grandma hopes to visit more. Take care. Your porch is so fabulous! I liked last years pumpkins, I just am not ready for fall yet! I'm not ready for fall yet. Give me a few weeks and I'll be all over it. Can't wait to see what you end up doing. I hope you have better luck with your pumpkin patch than I did with mine. Mine was all vines and flowers but no pumpkins! :( I still love decorating for fall though even though my pumpkins are store-bought. Great ideas there. I am so ready for the cooler weather that comes with fall. I think it will get in the upper fifties in the mornings some next week. yay! Fab Ideas Debbie! I love decoration for fall although I love love my cottage gardens and will miss them fall is my favorite time of year. I think I am ready to get started next week anyway. I did buy some fall flowers on clearance at my favorite country store so that tells me it's time.I am working on some projects to use in my fall decorating and I plan to have a fall tag sale on my front wrap around porch this year then a vintage Christmas one. Hope you will come see when I get it all set up. Thanks for sharing! I love fall and also have already started putting things out. 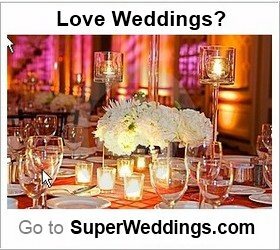 Love the candle ideas and your tablescape was beautiful! Love your fall lovelies. I am so ready here. nice decorations...simply beautifully captured shots...lovely! 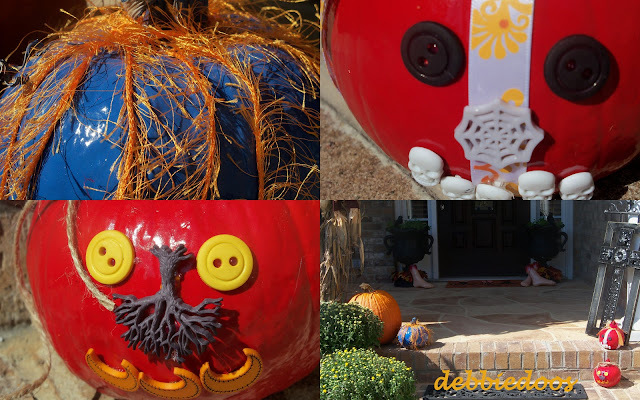 Awesome Fall pics, Debbie! LOL ... I remember your cute painted pumpkins from last year. And, soooo ready to start decorating, too! I'm with Pam. On September 1st at 12:01 it shall begin! lol I've been pinning photos on Pinterest all week! I love the decorated pumpkins! I'm going to do something like that!! It's still so darn hot here! I can't imagine fall just yet. But I do enjoy looking at all the pictures and dreaming of a some cool crisp air! Thanks for all of the great ideas! While I dread winter, fall IS a pretty time and the decorations really are so fun to work with! We don't really get much in the way of Fall here:( I wish we did though! My MIL and I went to Joann's yesterday and they have tons and tons of fall decorations...even Halloween stuff already. Thanks for the inspiration! I have my fall boxes down from the attic & I've been searching for ideas too. Nice ideas Deb! I just an sticking to my guns and not starting yet! The painted pumpkins are cute! Debbie, I am so *not* ready to decorate for fall. Yikes! I need to get with the program!!! Thanks for the lovely inspiration. I love that little corner in your breakfast room. Too cute! These are such wonderful ideas. The candle in the first picture is beautiful. I could look at fall decorating ideas till I fell over. I love Fall, my favorite time of year! A blogging friend, a bee and a blab! Newbie party top three links this week! Upcycling a wood pallet, DIY project FREE! Chalk paint, terra cotta pots, MUMS the word!